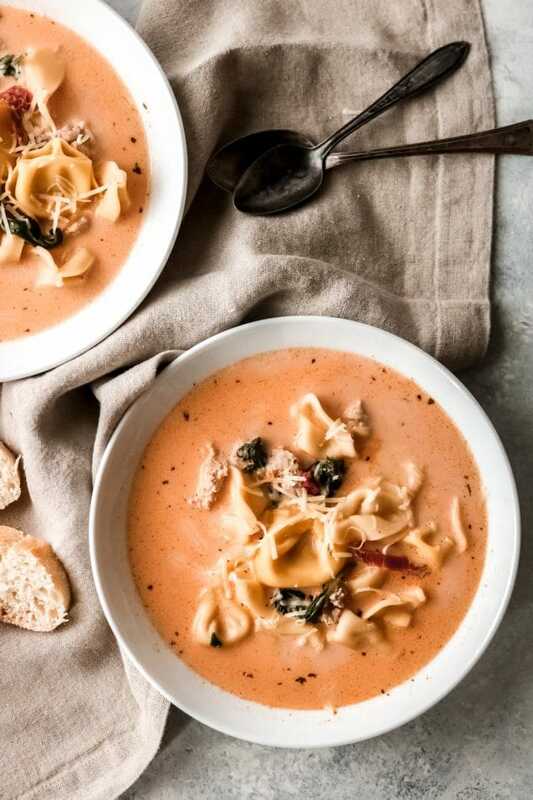 The weather is starting to finally cool down which means it’s time to enjoy all the rich and creamy soups like this creamy tomato tortellini soup. We’re finally seeing some much-desired cooler temperatures here in the Midwest and I couldn’t be happier. It’s that time of year when I’m ready for all things Fall, like soups, and warm drinks, bonfires, and all the plaid clothing. 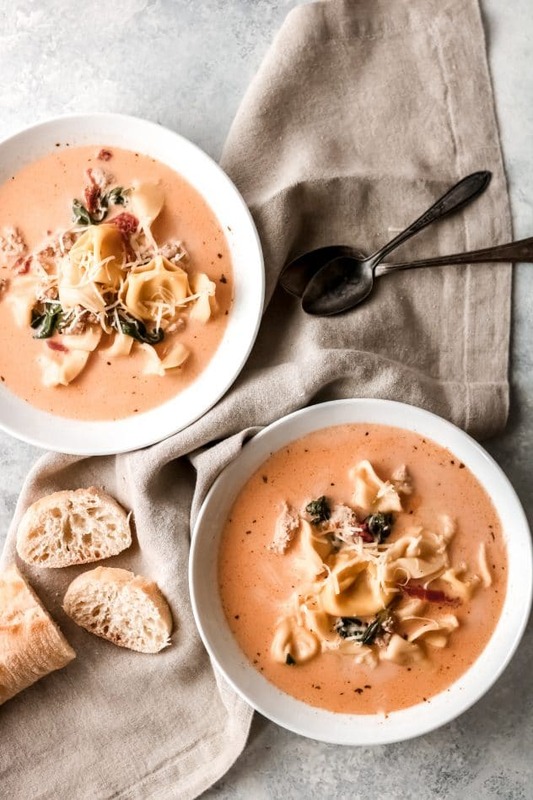 This creamy tomato tortellini soup is the perfect meal to welcome in this cooler weather. Made with fresh tortellini, cream, Italian sausage, spinach, and sun-dried tomatoes. 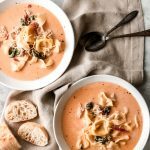 A creamy tomato sauce is probably one of my favorite options for both pasta and soup, or in this case a soup with pasta! 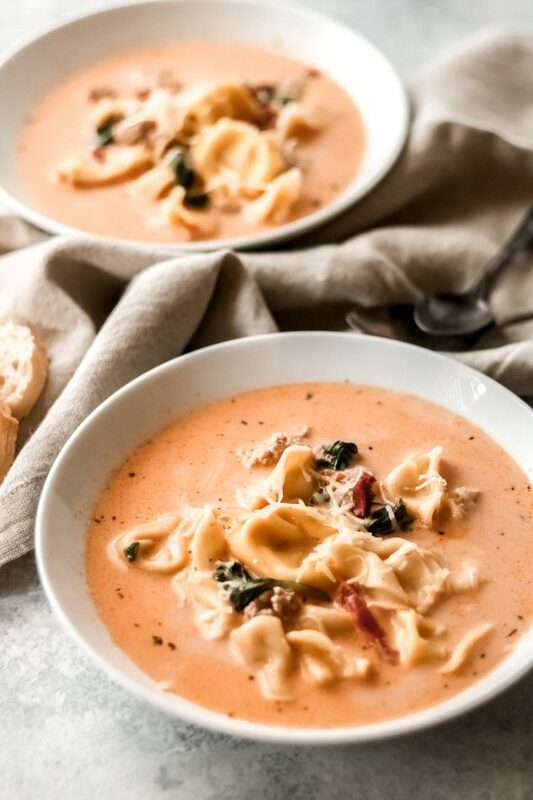 The fresh four-cheese tortellini is the perfect centerpiece for this soup, complemented by Italian sausage, fresh spinach, and sun-dried tomatoes, all blanketed in a velvety rich creamy tomato sauce. You’re going to want more than one bowl of this soup, I promise you that! This is also a soup you can put together fairly quickly. In under 30 minutes, you’ll have this rich and creamy soup ready to serve. I served this soup with a freshly-sliced baguette and it was dee-licious. This is also a soup the whole family will love, with its rich but subtle flavors. 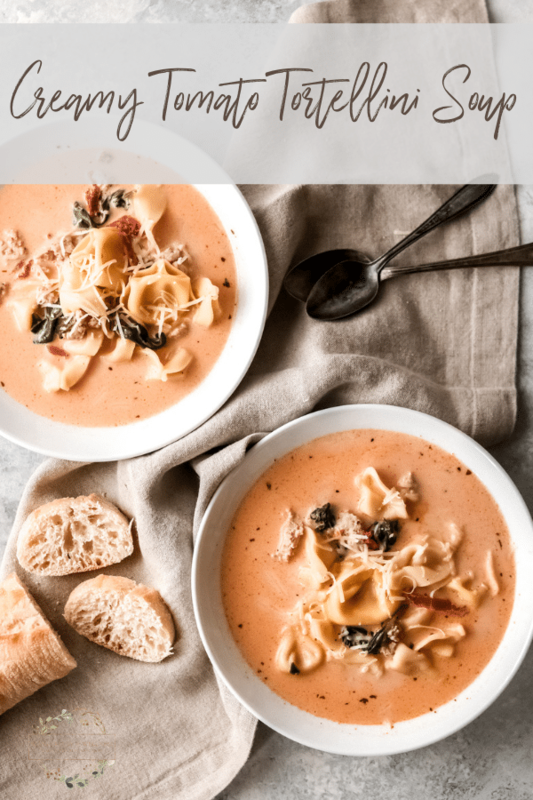 Let me know how you liked it in the comments below, or share your own pictures of your creamy tomato tortellini soup on social media! Be sure to tag Wanderlust and Wellness or use the hashtag #wanderlustandwellness so I’ll be sure to see your own creations! In a skillet, cook the sweet Italian sausage, drain, and set aside. In a large stock pot or dutch oven, add the chicken broth and bring to a boil. Once boiling, add the tortellini and boil for 7 minutes. Reduce heat to medium-low, add in the heavy cream, sun-dried tomatoes, spinach, cooked sweet Italian sausage, salt, basil, and tomato sauce. Stir to combine and simmer for 15 minutes. Make sure it does not continue to boil. If needed, reduce heat to low. Serve soup and top with freshly grated parmesan, if preferred.